Print your logo onto these custom printed hooded microfibre beach towels or one of our other innovative beach towels and use them in your next marketing campaign as a unique giveaway item. These Fine full coloured microfibre towels are super absorbent and lightweight. Ideal for a practical gift for the beach. Keep your customers safe from the sun and dry after a shower. The hooded beach towels are just multipurpose. Also great to protect from an unexpected summer rain! Printed in full colour sublimation the towels are made of 80% polyester + 20% nylon, 250 GSM. Comes with a washing instructions label: 40 degrees machine wash, Do not dry clean, Do not bleach, Do not dry by heat, Do not iron. Other innovative corporate gift ideas that could be suitable to create brand awareness include these cheap promotional Promotional Microfiber Towels - XL, quirky advertising gifts such as these Microfiber Towel Keyrings or how about using one of our more bespoke custom made products such as these great quality Microfiber Beach Towels with Pocket? 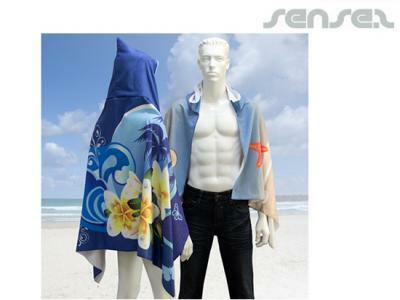 Personalise your hooded microfibre beach towels or custom design beach towels for your marketing campaign. How can these unique promotional hooded microfibre beach towels or our personalised beach towels fit in with your marketing strategy and help you maximise your brand exposure? Our custom made Hooded Microfibre Beach Towels can be produced from a minimum quantity of 50 pieces. We can have your logo branded on these corporate Hooded Microfibre Beach Towels in Full Colour Digital Print. A setup fee of AU$180.00 will apply to make the film.